Chiroflow "Stress Detox" Water Pillow - Eat Move Meditate - Simple habits. Sustainable health. Comfortably relieves cervical pain and associated headaches. 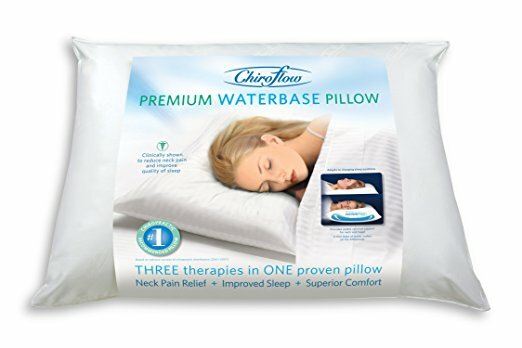 Instantly adjusts to any sleeping position; firmness is personalized by the amount of water added. With its water layer at the base, provides outstanding and responsive support for the head and neck. Continuously responds to changes in your sleeping position, adjusts to fit your shape and firmness can be personalized to your preferred comfort level. A layer of super-soft, hypo-allergenic DuPont® polyester fiber floats over top of the water layer and provides outstanding comfort. A thermal insulator fully encases the water layer to prevent body heat from being drawn from head, neck and shoulders.